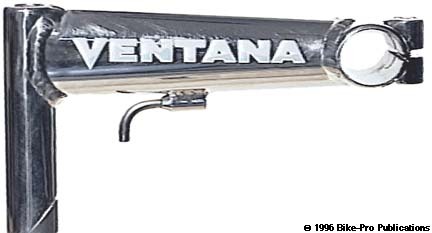 This review is for historical purposes only, Ventana doesn't sell their stem other than with one of their frames. The Ventana stem represents the best of hand crafted, high polished aluminum stems. The quill is fabricated from solid aluminum rod that has been drilled through form the top for the expander bolt, and bored, with a deep recess from the top so the expander bolt head sits well into the quill. This is a nice trick, reducing the length, (just 100mm), of the expander bolt, (and thereby the bolt's weight, it weighs only 42 grams). Recessing it this way decreases the length of the stainless steel bolt by one inch. The wedge piece is made of machined aluminum rod and weighs 16 grams. The extension section is made of aluminum tubing and is TIG welded to the quill piece. 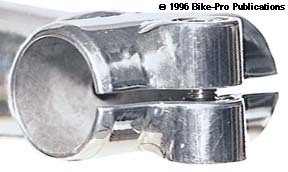 The handlebar binder tube is made of sturdy aluminum tubing, (with a heat release hole facing into the extension), is cleanly TIG welded to the extension. The binder fittings are made of machined aluminum rod, that is drilled and tapped for the stainless steel binder bolt. The binder tube has been miter cut so the binder fitting piece lays into a recess so that when it is welded to the binder tube there are long joining surfaces for durable weld contact. After welding the fitting on the front of the stem is sawn through creating the binder cinch system. Beneath the extension section, there is a TIG welded aluminum "macaroni" brake cable stop/routing guide. This piece is threaded on the inside for the routing tube, so that it can't dropped or lost in the future. The stem is then heat treated to bring it to T6 ductility. After manufacture the entire stem receives an intensely high polish, using various polishing compounds on a polishing wheel. The finish is so bright that it can be used as a mirror for shaving. This high polished finish is difficult to see in the image of the complete stem, because there is a tendency for high silver colors to "photograph" as a white or pale blue in color, but the detail shots will give you some impression. 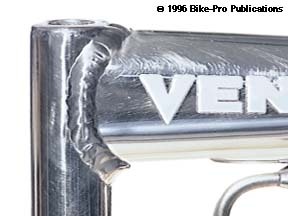 The Ventana aluminum stem has a 25.4mm diameter binder tube to fit all bulged style mountain handlebars, or 22.2mm bars with a handlebar shim, is available in 125mm, 138mm, or 150mm extension lengths in either a 0 degree or 20 degree rise. It is made only in the 1" diameter. The weight of a 138mm Ventana stem with 0 degree rise is 251 grams.